Hollywood Saint - Heath Ledger: A Life in Pictures exhibition review (Canberra) | Daily Review: Film, stage and music reviews, interviews and more. In its first major exhibition in over ten years, the National Film and Sound Archive (NFSA) in Canberra shines the spotlight on one of Western Australia’s brightest stars with the exhibition Heath Ledger: A Life in Pictures. Produced in collaboration with Western Australian Museum, it sweeps through Ledger’s career – it includes items from his high school hockey stick through to his own production diaries from The Dark Knight Returns. But between this microscopic view and the spotlight, Ledger himself remains hazy. Presented as Perth’s James Dean, the exhibition doesn’t just preserve him in amber as an idol but gives many perspectives. His is a familiar story in Australian art – the kid who made it big in local film (Two Hands via Home and Away) and got lost in the American movie machine. He was a Gen X Errol Flynn. The exhibition takes over the NFSA, stretching from its exhibition hall into smaller rooms screening Ledger-shot music videos. The Arc Cinema shows the film I am Heath Ledger every two hours and it is best watched before as reminds you of Ledger’s great roles. The film gives context and presents the main challenge of a dead celebrity: who makes the myth of Ledger? As well as showing highlights and lowlights (remember A Knight’s Tale? Ten Things I Hate About You? ), I am Heath Ledger jump cuts into the actor’s home videos and interviews with family and friends including Trevor Di Carlo who supplied many of the home videos where Ledger dances through grainy shots. But this cooperation of some family and friends gives their perspective and so glosses over the more difficult parts of Ledger’s story. He completes the well-worn Australian star journey to America, settling into a Brooklyn star life that sees him buying a piano for Ben Harper. But his issues with medications (leading to his death in 2008) and troubled marriage to actor Michelle Williams are shadows beyond the spotlight. Inside the exhibition itself, the story is more comprehensive, constructed around his early life in Perth running through each of his films. Costumes, stills and video bring the film back to life. We’re reminded of the iconic scenes such as Brokeback Mountain’s kiss, perhaps his greatest role as it brought two homosexual cowboys into the mainstream cinema complexes of Middle America. The NFSA gives the exhibition more room to breath than it had in WA by devoting most of its ground floor to it. Recently appointed director Jan Mueller says they have wanted to build on the original exhibition significantly. “We added costumes designed by Anna Borghesi for Ned Kelly, particularly one worn by Naomi Watts… We’ve also added audiovisual material from our collection as well”. It’s when he is airing his own dirty laundry, turning the lens on himself that the exhibition is most revelatory, giving us the small moments of his life. The audio visual material is worth seeking out particularly the digitised character journals that might be missed on iPads in the front space. In this journal you see Ledger cutting up comic books, lines from the script and pop culture trash to prepare for Joker role in The Dark Knight Returns. Hecommitted deeply to the method of this role,staying in make-up when not shooting and going deeper into the the mind of Batman’s nemesis. Then there are the tantalising traces of Ledger the man with personal photographs and Polaroids showing his love for wife Michelle Williams, travel and photography itself. As well as globetrotting images from Prague and offset moments from shoots, there’s a collection of images Ledger took at a laundromat in New Orleans. These feature his friend Trevor di Carlo and Ledger’s caption: “Three friends sitting around at a laundromat entertaining each other while out clothes wash and dry.” And it’s when he is airing his own dirty laundry, turning the lens on himself that the exhibition is most revelatory, giving us the small moments of his life. 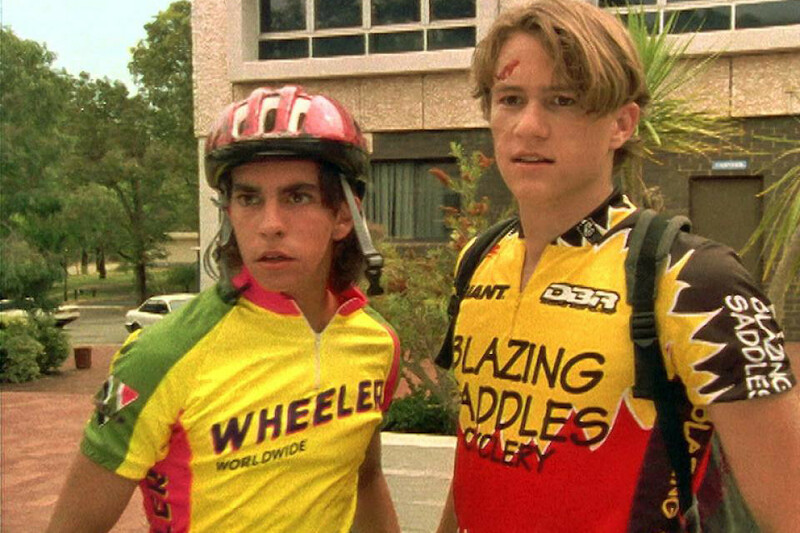 Heath Ledger (right) in the 1996 Australian 26 part TV series ‘Sweat’ about a gay cyclist. In a pre-Instagram age, Ledger was rarely without a camera (his collection of antiques os part of the exhibition) and watched his own rushes to develop his acting and directing. In I am Heath Ledger, director Ang Lee says he was surprised at Ledger’s curiosity about how filming progressed but saw him thinking about how to create his own shots and reframe every moment of the film. Since Ledger, Australian stars have made the path from Sydney to Hollywood one you can return from. While Ledger got lost in America, other actors like Chris Hemsworth and Cate Blanchett have made it big in Hollywood and returned in a way that Ledger did not. He disappeared in a life, a character and died halfway through filming The Imaginarium of Doctor Parnassus with director Terry Gilliam shapeshifting his character with several actors including Johnny Depp and Jude Law. Heath Ledger: A Life in Pictures (on at the NSFA until February 10) shows us the career he might have had – peaking as an actor then evolving into a director, perhaps one day mastering the lens that had made him. Main image: Heath Ledger at the 56th Berlin International Film Festival in February 2006. Image by Howie Berlin. George Dunford is a writer and digital strategist living in Canberra. He has written for Meanjin, Australian Book Review, Lonely Planet, The Big Issue among others. Always enjoyed Two Hands. Great Aussie crime movie with wicje sende of humour. Heath even outshone Bryan Brown. Weird of you to claim that “10 Things I Hate About You” is a lowlight of Ledger’s career. It’s widely considered Ledger’s breakout role and one of the most beloved and intelligent teen comedies ever made?